We recommend taking one sachet of Fresh Spirulina daily and preferably during the morning. After defrosting Fresh Spirulina can be consumed in almost any form. The 6 package supply currently on promotion lasts for 3 months when taken at the recommended dose. Why is it important for Spirulina to be fresh? Our Spirulina is fresh frozen, so it can last an entire year when kept in a freezer (-18C). When refrigerated, (-5C) its shelf life is up to 14 days. More questions? Contact us or visit our FAQ page. Spirulina contains Chlorophyll which has a similar composition to hemoglobin, the molecule in the human body that transports oxygen. Studies show that this similarity can lead to an increase in the quantity & quality of your red blood cells. This helps clean and rejuveante your body, boost immunity, aid healing process and improve digestion. Fresh liquid Spirulina also contains Omega-6, an essential nutrient that is easily absorbed by the body helping release energy and improve brain function. Fresh Spirulina has powerful anti-inflammatory properties that heal and soothe inflammation. It's a natural remedy for oxidative damage and a fantastic source of antioxidants. Oxidative damage can harm your cells and can drive chronic inflammation, which contributes to chronic pain and other diseases. Fresh Spirulina contain’s nature’s only source of Phycocyanin, which is a powerful antioxidant that can prevent and slow damage to cells caused by unstable molecules that the body produces as a reaction to environmental and other pressures. Spirulina is known to aid in weight loss as a bioavailable source of nutrients and vitamins that is low in calories. It also contains powerful amino acids that help suppress hunger cravings and help with blood sugar regulation. Spirulina contains vitamin E, selenium and tyrosine, which are all known for their powerful anti-aging effects. The antioxidants present in tyrosine eliminate free radicals and slow down the aging of skin cells. Spirulina is also a wonderful source of chlorophyll, which has cleansing properties, and also helps your skin retain moisture, which is a major key to maintaining the appearance of smoother, hydrated skin. See how Fresh Spirulina can help with acne. Fresh Liquid Spirulina contains chlorophyll which is known to cleanse important organs in the digestive process. Chlorophyll works to detoxify the liver by eliminating detrimental toxins. Fresh Liquid Spirulina also contains amino acids that provide live prebiotic enzymes. Prebiotics help probiotics grow and remain in your digestive system. These live enzymes help facilitate healthy digestion and also helps fight intestinal infections as it has immune cells, which fight off virus and thus promote digestion. Spirulina has been know to strengthen and boost immunity which has helped prevent colds and infections. It contains nature's only source of Phycocyanin which boosts the immune system by fighting damage to cells that may otherwise cause disease in the body. Phycocyanin's anti-inflammatory activity helps inhibit dangerous inflammatory actions in the body and help protect against disease and naturally flush the body of toxins. Spirulina has protective effects against allergic rhinitis in humans. Studies show that Spirulina works by boosting levels of cytokines and interferons – immune system signals that send alerts to immune ‘fighters’. The result is fewer allergy symptoms, especially for those suffering from allergic rhinitis. This is the best brand of spirulina because it’s FRESH. I put it in my water every morning, use it as a smoothie boost or take a dose of the concentrated spirulina when I’m feel like I’m coming down with something. What a difference this fresh pure spirulina has made in my life. I have so much more energy and clarity of mind. Less aches and pains too! I just take it with water and a little citrus, it is so refreshing. Highly recommend this product! Absolutely amazing and so pure. If only everyone knew all the incredible benefits about spirulina and the health benefits. We are feeling like ten million bucks. 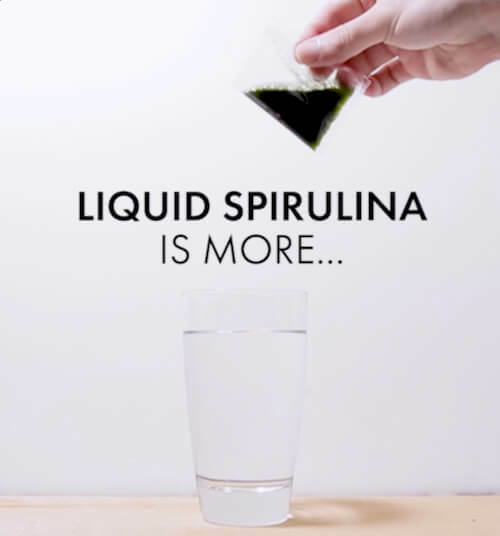 We incorporate this spirulina into drinks and tastes great! I have taken spirulina in capsule form years ago and it was very beneficial, but the results from this pure, fresh form were outstanding! I have had a significant improvement in energy, mental clarity and overall wellbeing. Delivery is very efficient and friendly. I would highly recommend this product! Let your body experience the complete package of health benefits offered by fresh Liquid Spirulina. Each serving is packed with antioxidants, anti-inflammatory properties, amino acids, vitamins and essential nutrients that are easily absorbed & digested by your body. We deliver Spirulina in liquid form; 100% liquid, raw and pure. Our liquid Spirulina is more bio-available than powder, meaning your body fully absorbs the numerous health benefits associated with live prebiotic enzymes, rich nutrients, and powerful antioxidants. Our Fresh Liquid Spirulina is nurtured in an innovative micro-climate system using completely organic ingredients, in Richmond, B.C, Canada. It's virtually tasteless and odorless, a testimony to its purity - we promise!